Knitting is very much in vogue at the moment and the libraries where I work are offering a way for you to get involved and learn a new skill. There are knitting groups all across the borough of Caerphilly but these three libraries now have thriving groups where you can knit, chat and get a﻿ free cup of tea. The group meets every Friday at 10.30am and carry on until they are all knitted out. They are currently working on a group project and they are knitting chicks for the Velindre Hospital charity. 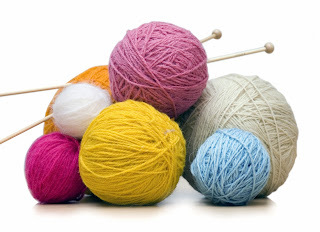 The ladies meet upstairs every Monday at 2pm and are currently knitting clothing for a local premature baby ward. This lively bunch descend upon the library at 10.30 every Monday and knit until we push them out through the door so we can close for lunch. If you are more of a lone knitter the libraries stock great knitting pattern and inspiration books along with many other types of craft books so you can create your own unique knitted pieces at home. It would be great to see some new faces at these groups so come along and get involved! Pangam library raised over £100 knitting those chicks! Thanks for the vocalisation on the bloggishness lady! Wow... imagine if i aired my grievances on a blog. It wouldnt get past the ccbc censors.